Recognized by Consulting Magazine as a “Top 25 Consultant” and by Computerworld as a “Premier 100 IT Leader”, Nick has been quoted, published, and interviewed by the popular business and technology press including Fortune, Time Magazine, Financial Times, CIO Magazine, Computerworld, Optimize, Internet Week, RFID Journal, and Washington Technology, as well as broadcast media such as CNBC Squawk Box, History Channel and Discovery Channel. 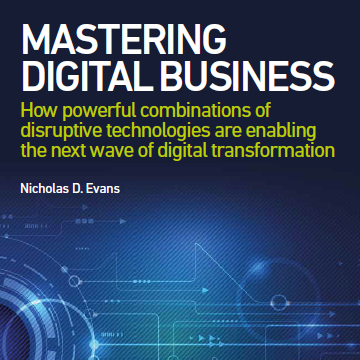 Nick’s latest book, Mastering Digital Business, was an award winner in the “Business Technology” category of the 2017 Axiom Book Awards. Some of his earlier works, including “Business Innovation & Disruptive Technology: Harnessing the Power of Breakthrough Technology…for Competitive Advantage” and “Business Agility: Strategies for Gaining Competitive Advantage through Mobile Business Solutions”, published by Financial Times Prentice Hall, have both been staples at leading business schools. His writing for CIO magazine gained him recognition as one of the “Top 50 Tech Writers” to follow in 2016. 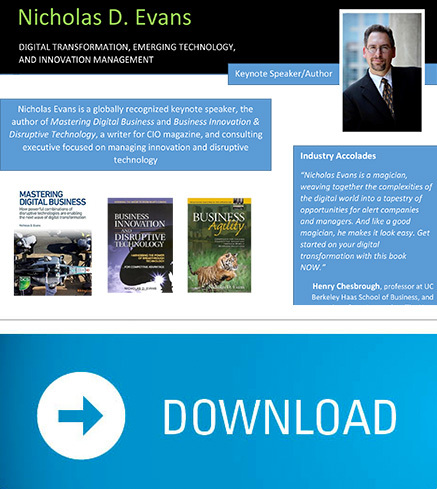 View some of Nick’s most popular articles below or visit his blog for additional insights and resources on managing innovation and disruptive technology.